Hi friends. 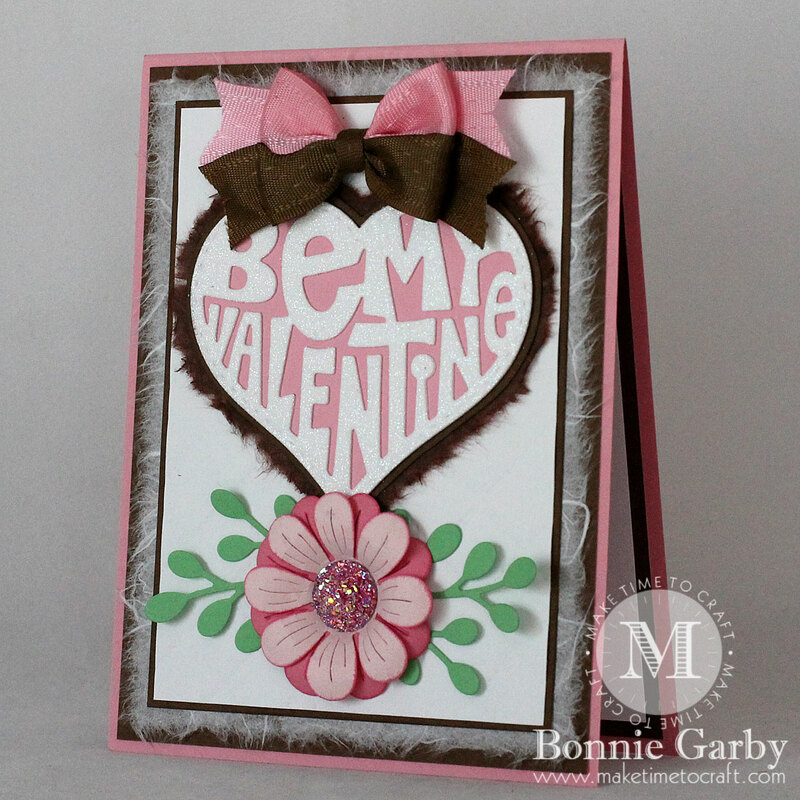 Bonnie here today with another fun card for Valentine’s Day using my favorite Delicate Stitched Satin Ribbon from Really Reasonable Ribbon. If you have not tried making a bow with Delicate Stitched Satin Ribbon, I encourage you to. It is a pretty and lightweight ribbon and it works like a dream for bow making. AND, it really quite inexpensive. What else could you want in a ribbon?!! My gorgeous dies are from Cheery Lynn designs. To create the shimmer on the words in the heart, I covered the front and back side of a white piece of cardstock with Stick It Adhesive and then die cut. Peel off the front adhesive backing and cover with white glitter. 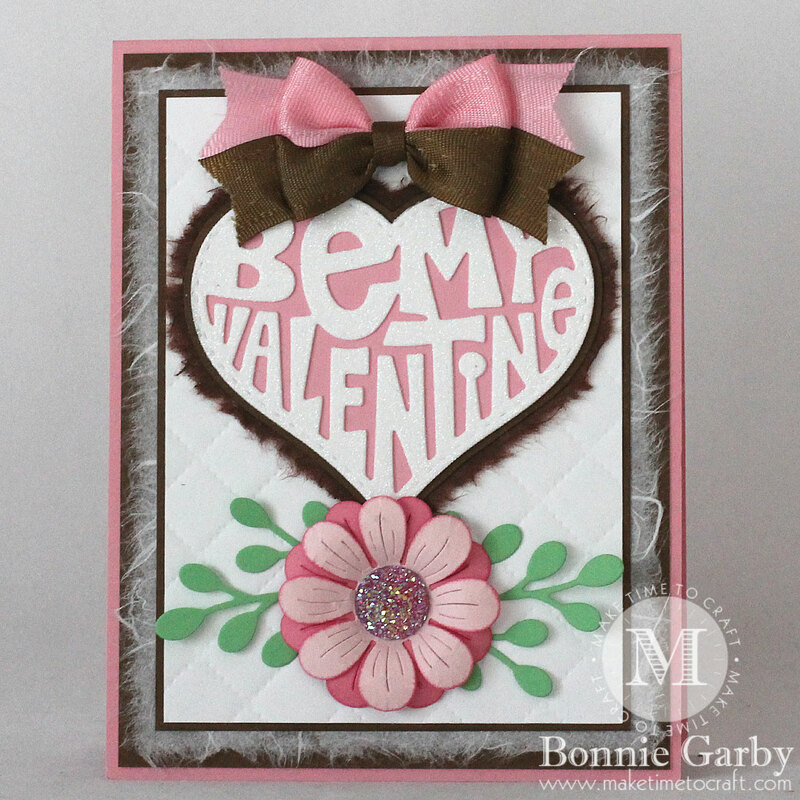 Then peel off the adhesive backing on the back of the die cut and adhere to a pink heart. My flower was cut, the edges of the petal were inked and the petals were shaped with a foam pad and stylus. Then adhere the layers and add a gem in the middle and the foliage to the back. My bow was created on my Bow-it-All V3.0 using Sherbet and Turftan Brown 5/8″ Delicate Stitched Satin Ribbon. Love this color combo! 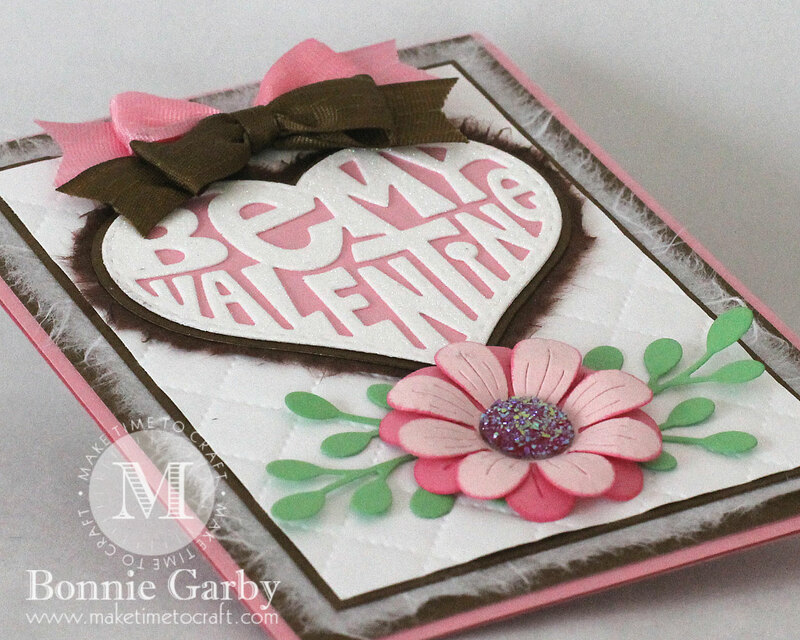 The quilted embossing folder adds such a great subtle texture. I absolutely love your double bows! 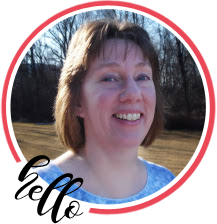 Thank you for joining us at Crafty Gals Corner for our Add a Heart challenge. 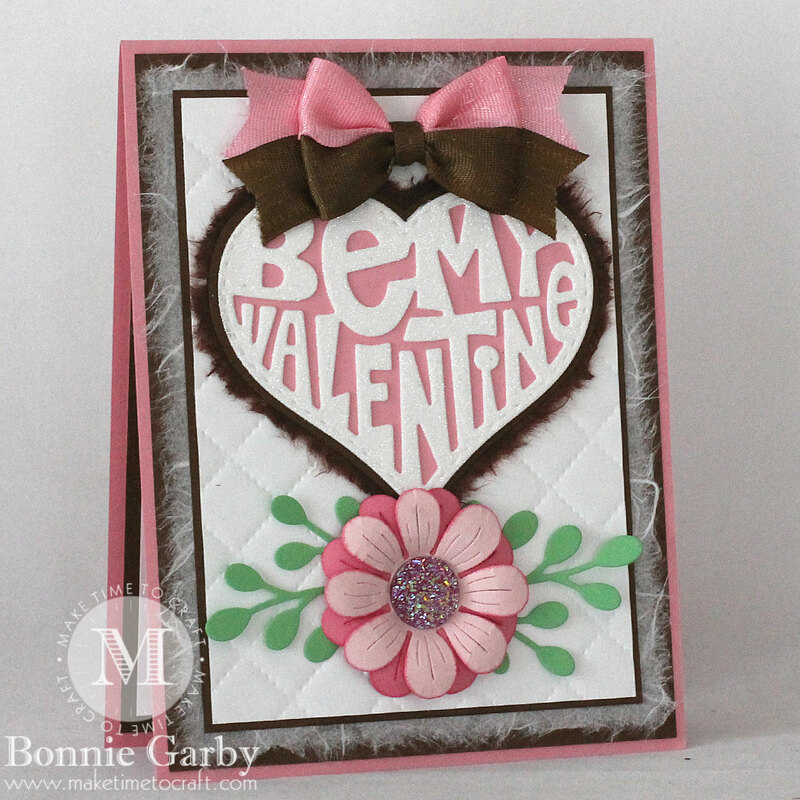 Another beautiful card, Bonnie! I always love seeing your cards in a challenge line-up, and I can always tell they are yours. : ) I use your mulberry technique quite a bit (used it today actually), but hadn’t seen it in the shape before; it looks equally as good around the heart! Also love your gorgeous bows and while I don’t have a bow tying tool like yours, I have used the toothpick idea to separate my bow loops on my bow easy. Thanks for all the inspiration. And thanks for playing with Jo’s Scrap Shack. This is so cute, what a lovely layout & pretty colour combo. Bonnie this card is gorgeous hon!! I absolutely your style! Love that bow at the top and the colors are so beautiful together. Love that heart and sentiment… just darling! Thanks so much for playing along with us this week in our Funday Friday challenge!! Remember we are now always anything goes! Have a wonderful day!